During my almost six-year tenure as a District Court Judge, I have had the privilege of handling over 3000+ cases. It has been an honor to carefully follow the law, efficiently preside over court matters, and kindly respect the lawyers, litigants, jurors, and all who arrive at the 150th District Court. In addition to presiding over malpractice, product liability, commercial, and personal injury litigation, it has been my goal to help litigants in family law cases create a path of healing and peace. Besides my courtroom duties, I have served on the Bexar County Juvenile Board, helped improve the Bexar County civil court system, wrote numerous legal articles, taught law to lawyers and law students, and served on the State Bar of Texas Pattern Jury Charge Committee. As a vigilant caretaker of Texas law and a dedicated advocate for strengthening families, serving as your judge has been my highest calling. An extension of that calling has been to build PEARLS Court. I saw the severe challenge faced by teen girls in foster care. So with the help of community partners, 40+ volunteers, and my fellow judges, we created this therapeutic court. PEARLS Court provides counseling, life-skill training, and essential mentoring to strong, but deeply challenged, young ladies in grades 9-12. The great news is our Girls have blossomed in PEARLS Court. We achieved every one of our goals! We even had our first two high school graduates in June. While we've made great progress, there is much left to do. 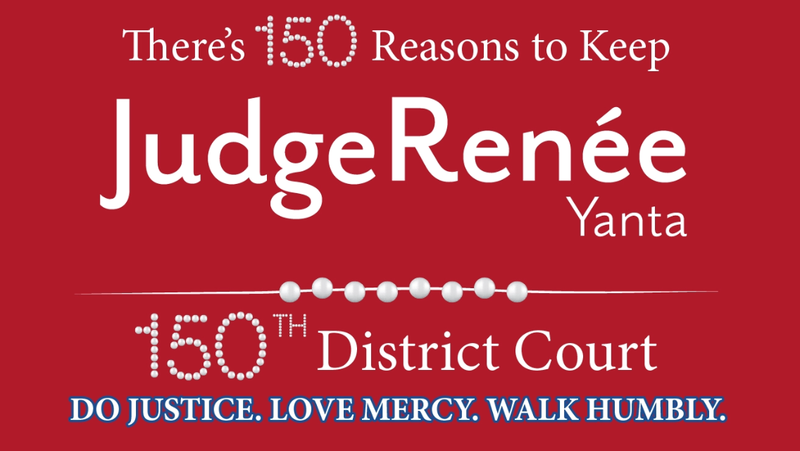 To ensure I can continue to serve you as your judge, it is time to begin focusing on my re-election. I am very blessed to have broad support from every part of our community and no Republican primary opponent--blessings I deeply appreciate. But we have a lot of work to do for the general election in November 2018. To that end, our first fundraiser and Campaign Kick-off Event will be October 26th at the beautiful home of Patricia and Michael Dennis, at 103 Devine 78212. I personally invite you to join me October 26th! I am deeply grateful for your investment, and look forward to continuing to work with you to: Do Justice; Love Mercy; and Walk Humbly.